Stitch an heirloom! 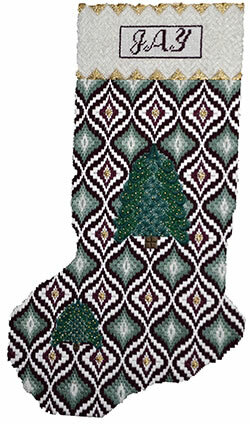 Christmas trees decorated with gold beads create a beautiful, festive stocking for that special someone! Fuzzy Stuff, Whisper and Very Velvet are just a few of the fun fibers. Tiny Christmas trees decorated with gold beads create a beautiful, festive stocking for that special someone! 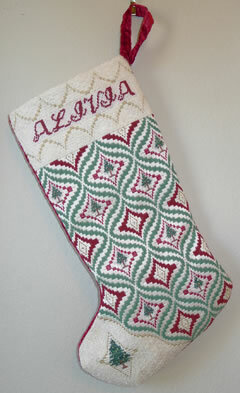 Threadworx, Very Velvet and Fuzzy Stuff are just a few of the fun fibers that create this stocking. 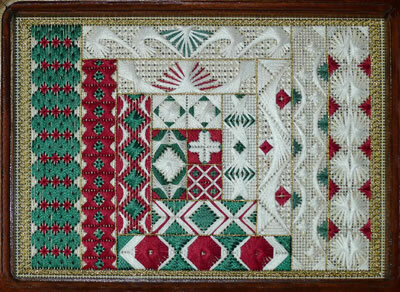 Inspired by a Log Cabin Quilt, this emerald, garnet and white design is beautiful when framed and also fits in a Patches N’Planks 5”x7” jewelry box. Colors can easily be changed to match your décor. Lots of textured specialty stitches! One design but so many possible combinations! 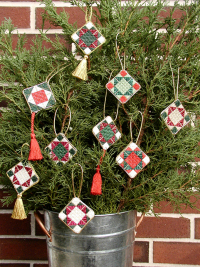 Use your leftover stash threads to create numerous ornaments.